Your top priority is keeping your children safe in the car, right? So why is the world of baby and child restraints so hard to negotiate? In Part 1 of our three-part series, we’ll pick our way through the legal do’s and don’ts of child travel safety in Australia to help make sense of it all. Up to six months old: your baby must travel in an approved rearward-facing child restraint specifically designed for newborns. From six months to four years old: your child must be in either an approved rearward-facing or forward-facing child restraint, such as a child safety seat. From four years to seven years old: your child must be in either a forward-facing child restraint or a booster seat restrained by a properly adjusted and fastened seatbelt or child safety harness. From seven years to sixteen years old: your child must use a booster seat or a seatbelt properly adjusted and fastened. This sounds clear enough. But when exactly should you make the move from baby capsule to child seat, and child seat to booster, bearing in mind that children all grow at different rates? Six months is the minimum for baby restraints, but many safety experts recommend staying rearward-facing for as long as the baby comfortably fits the inbuilt harness. Consider moving to a child seat, then, when he or she passes the labelled upper shoulder markers; or, in the absence of markers, when the shoulders are above the top shoulder harness slot for rear-facing use. Legally, your child can use a booster seat from his fourth birthday. Experts recommend, however, sticking with the child seat for as long as it fits, as it is the safest way for children to travel. Again, check the shoulder markers on your child’s forward-facing seat to see if he has outgrown it. A booster seat should be used with a lap-sash seatbelt. The lap belt should sit low across the top of your child’s thighs and the sash belt firmly across the centre of his shoulder. Booster seats with a back: These are the safest boosters, offering head and side impact protection. There are two approved types: booster seats for children aged six to eight, and those for children aged eight to ten. Forward-facing restraint/booster seat combinations: These seats can be forward facing until your child turns four, turning into a booster when you tuck away the harness straps and use the lap-sash belt instead. Booster cushions or Backless Booster seats: These have no back support. While no longer manufactured in Australia, they are still legal to use. However, safety experts strongly recommend using a full booster seat as it offers far more protection to the child’s head, neck and spine in a crash. 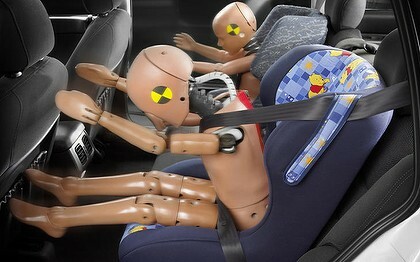 In a side-on crash, particularly, the backless booster leaves the child totally exposed. In Part 2, we’ll investigate other travelling queries – ie. can my child sit in the front seat? What happens in a bus or a taxi? How do I correctly fit and adjust the restraint? And in Part 3, we’ll investigate the wealth of restraints on the market, both here and online from overseas. Is that fancy new car seat really all it’s cracked up to be? In the meantime, why not check out the use of ISOFIX attachments now available in Australia? Used Car Safety Ratings: Which Small Car Gives 5-Star Protection? Used Car Safety Ratings: Which Medium Sized Cars Top The Rankings?